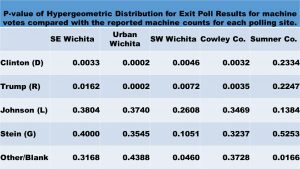 This post is a primer on how to test exit poll results with official results using the Hypergeometric distribution function in EXCEL. You can check my computed p-values for the exit poll results using this formula. The Hypergeometric distribution is used to determine the probability (p-value) of getting a random sample, drawn without replacement, as extreme or more so given the population that the sample is drawn from. If that wording sounds unnecessarily complex, I sympathize. Unfortunately, precision is often complicated to articulate. This definition is hard to parse and you need a working knowledge of what the statistical terms and phrases mean. “With” versus “without” replacement is an important descriptor of a random sample. A situation with replacement is akin to selecting a card from a deck, then returning it back to the deck before drawing another card. Without replacement is selecting a second card from the 51 remaining in the deck. This nuance in the drawing of the sample affects the basic assumptions statisticians build equations from. Different statistical distributions have been developed to handle the two situations. Because voters were only asked once to fill out our survey, the exit poll sample is ‘without replacement’ and the Hypergeometric distribution is the most appropriate choice for testing the size of the errors. Another important and relevant statistical concept: One-sided and Two-sided tests. Most distributions, including the Hypergeometric distribution, have the majority of data crowded around the average and the data gets sparser the farther away from the average. This type of distribution has ‘tails’. There are the two directions of tails relative to the average value: upper and lower. When we perform a statistical test, we are looking at the deviations from what is expected given the underlying distribution of the data. In some cases, we may only be interested in deviations in a particular direction – high or low. In those cases, we can increase the precision of our test by only looking at one end of the distribution. This is called a one-tailed test. In other situations, we are interested in differences in either direction, so we are examining both the upper and lower tails of the distribution. In our exit polling data, we are looking at the deviations both positive and negative, to determine if either are unusually large. Therefore, it is a two-sided test. Sample Success – This is the total number of exit poll surveys for the candidate in that race at that polling place using that voting mechanism. Sample size – This is the total number of usable exit poll surveys from voters for that race at that polling place using that voting mechanism. Population success – This is the total number of voters for the candidate in that race at that polling place using that voting mechanism. Population size – This is the total number of voters for that race at that polling place using that voting mechanism. Cumulative – Input 1. This is a technical detail of the statistical test. A zero will result in the probability of getting exactly the results we input, no more and no less. Putting a one here gives the lower tail probability, which is what we want. EXAMPLE: Hillary Clinton received 435 votes out of 983 cast on the voting machines at the SE site. That’s a 44.25% vote share. Our exit poll data showed Hillary Clinton received 306 votes out of 645 survey responses to this question from voters who cast their votes on those same machines at that polling location. That’s a 47.44% vote share. The difference between those two values, -3.19%, is the error. This error measurement is computed for each candidate, race, type of voting equipment and polling location. Whoa!! I thought you said Hillary got cheated? This result is a near certainty. That’s because our exit poll sample had a larger percentage of Hillary voters than the official results did. 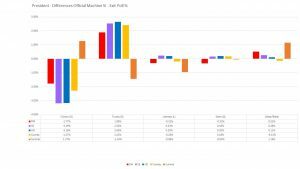 Her exit poll results lie in the upper tail of the distribution, well above the official average. We just computed the p-value for the lower tail i.e. the probability of randomly getting as many Hillary votes as we did (306) or LESS. Next we need to compute the probability of randomly getting as many exit poll votes as she did or MORE. The upper tail of the distribution. Through the magic of math, we can find the upper tail probability with a modification to this function. Subtract 1 from our sample size and compute the lower tail probability for that sample size. Then subtract that lower tail probability from 1 to get the correct upper tail p-value. Finally, because we did not specify in advance what direction we expected to see, this is a two-tailed test. For two-tailed tests of this nature, the p-value is computed as double the minimum one-tailed p-value, capped at 1.0. 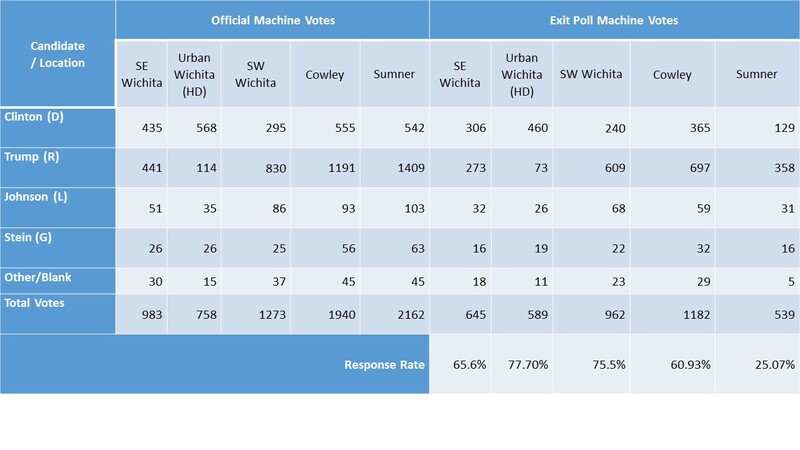 Two-tailed p-value for Clinton, Machine Votes, SE Wichita = 2*0.00325 = 0.0065. 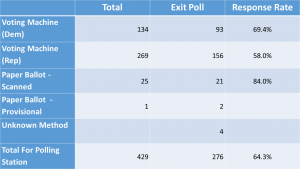 This post contains links to the citizens’ exit poll survey forms and results. I will post the analysis of those results separately. There were five sites sponsored by the Show Me The Votes Foundation. Each site was independently run by voters from that area. I provided guidance and instructions as well as training for volunteers. 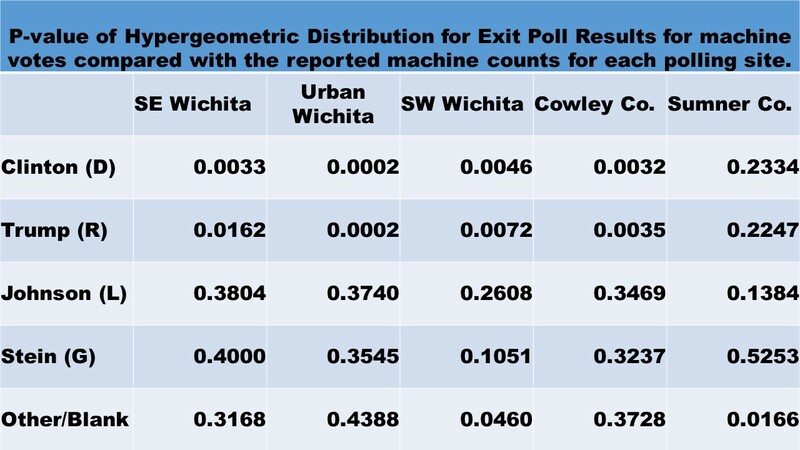 You can learn more about how these exit polls were set up and run here How to run an exit poll. Polls were manned the entire time the polling station was open. Voters were asked personally to participate; responses were kept anonymous. The site managers were all amazing. We got excellent response rates. This study and these results would not have been possible without their help and the help of the dozens of other volunteers who were willing to take a few hours out of the day on Nov 8th to man my exit polls. Thank you all. I ran the Southeast Wichita site. The questionnaire I used is the basic form that the others were built off of. All questions on that form were common to all five sites. There were no questions on races specific to my polling location. The Sumner County site was run by Glen Burdue in Wellington KS. He modified his survey to add some additional questions specific to his polling location. We had relatively few volunteers in the Wellington location, but he made up for it with dedication to the project. Glen spent considerable time notifying and clarifying his exit poll with the county officials not to mention collecting surveys all day long on Nov 8th. Then he counted all the surveys himself, no small task by itself. The Cowley County site was run by Pam Moreno of Winfield KS. She is an amazing organizer and and is a leader in the Women for Kansas – Cowley County chapter. We ran a volunteer training session one October evening. Her group also added a few questions to our basic survey that were specific to Winfield. She also got volunteers to help do the counting the next day and professional help with the data input into my spreadsheet for analysis. 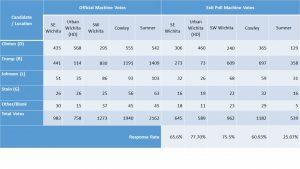 The Urban Wichita site was run by Lori Lawrence at the Health Department on 9th Street. She did a phenomenal job, doing everything from baking cookies to attract voters to respond to getting buttons printed up for our volunteers to wear. In our planning meetings, she made many excellent suggestions for ways to improve our exits polls. She ran the same basic questionnaire that I did at the Southeast Wichita site. She also did the complete first count on all her surveys. With 883 useable surveys, that was a huge chore! The Southwest Wichita site had two co-managers, Lisa Stoller and Leah Dannah-Garcia, two excellent ladies who were devoted to accomplishing this. They collected 1,435 usable surveys, a response rate to eligible voters of 80%. Fantastic. Counting all those surveys was a daunting task. I dare say that aspect of it was as difficult for those extroverts, who were so excellent at running the exit poll, as the task of walking up to strangers and asking them to fill out a survey form was for introverts like me. They needed help. I ended up parceling them out to other volunteers as it was an overwhelming task, even for a veteran survey counter like myself. Exit poll went well; no significant signs of election fraud. With help from nearly a dozen volunteers, I conducted an exit poll on one polling location during this primary. It even made the local newspaper. I am quite pleased with the results; everything went smoothly. It was primarily meant to be trial run for the Nov. election, making sure that I will be able to collect the data necessary then to identify problems with our machine counts. While some mistakes were made (all by me – the volunteers were fantastic! ), I feel confident that we will be able to accomplish that task in Nov. I know that many people are interested in the results of this survey. Overall, things looked good. There were a couple of yellow flags, but nothing I would recommend taking action on. The exit poll was conducted at one polling location with survey responses being compared to the machine tabulated results at the polling location. Respondents were asked how they voted, by machine, or a scanned paper ballot or a provisional paper ballot. Results are shown below. Due to the small number of paper ballots, both scanned and provisional, analysis results are shown for the machine tallies and for the totals for the polling location, but not for the paper ballots separately. The count of votes counted and survey collected is shown below in table 1. There is a discrepancy between the official count for provision ballots (1) and the exit poll count (3). This is likely due to errors in marking the exit poll, so I am not concerned about this discrepancy. We asked about six races with two candidates, three races in each party. However, only three of those races were applicable to everyone who voted at that location. There were multiple (5) precincts voting at the polling location. Three of the races asked about were limited to voters in only one or two of those precincts. As a result, survey takers could indicate a choice in those three races even if they did not actually vote on them. For that reason, I have labeled the data collected on those three races as ‘questionable’. Caution should be used in drawing conclusions from the exit poll data for those races. The results for the six races are as follows with the winners names bolded in table 2. 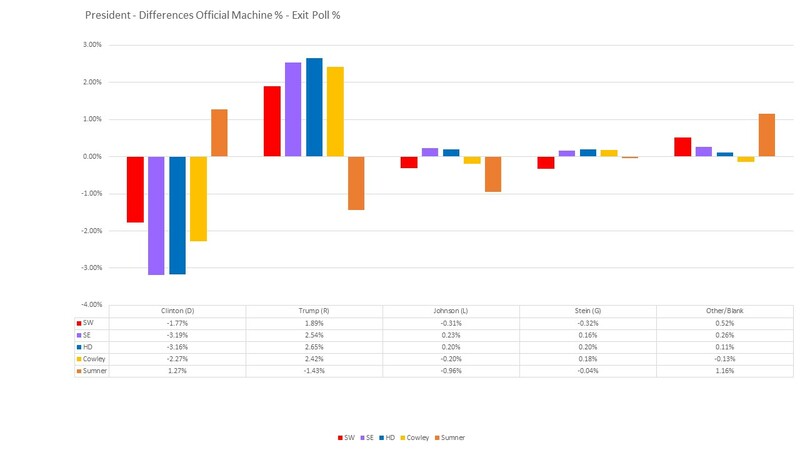 Assuming that the official results were accurate, I computed the probability of our exit poll results using the binomial distribution. I rated those results as being Green (looks good), Yellow (suspicious but not conclusive) or Red (definitely something wrong). The usual threshold for statistical significance is below 5%. There were no red flags, but two of the six races got a yellow caution rating. These results are shown in Table 3. Races that all survey respondents voted on were the U.S. Senate (Dem and Rep) and the U.S. Rep (Dem). Results for the losing candidates are shown in Figure 1. The Senate Race for Dem candidates is given a yellow warning because the probability of the differences between the official results and our exit poll is only 3%. This is not considered a red flag because we are making 12 different comparisons, which needs to be included in assessing the results. For example, if 12 comparisons are made using a 5% threshold, there is a 45.96% probability of at least one of them falling below that threshold by random chance. There’s a whole set of statistical techniques designed to account for multiple comparisons if I wanted to get really precise about it. 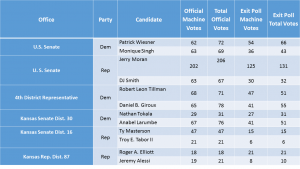 In addition, while the official votes skewed towards Ms. Singh, she lost the statewide election so even if there was manipulation, it would not have affected the outcome of the race. We had no method to identify what precinct people were in, so for the Kansas House and Senate races, survey takers could vote for someone who was not on their precinct’s ballot. For this reason, the exit poll data must be considered questionable. On the Republican side, since no precinct voted on both the house and senate races, the 38 surveys with both those races marked were not included in the totals for those two races. Results for the losing candidates of these races are shown in Figure 2. The official results for Kansas Rep. Dist. 87 race get a yellow rating. The results were skewed towards Mr. Alessi with only around a 1% chance of occurring by random chance. This is not rated as red because the exit poll data was questionable. However, since Mr. Alessi lost the election, even if there was manipulation, it would not have affected the outcome of the race. Posted on August 7, 2016 August 7, 2016 Categories Statistics, Voting, Voting machines1 Comment on Exit poll went well; no significant signs of election fraud. THE THEATER IS ON FIRE! This post is in response to this article at Nation.com. Sadly, this author does not understand the math well enough to realize that, despite the protests of the professional pollster interviewed, claims of widespread fraud are not baseless. Exit poll results for the democratic presidential primary provide not one but two solid pieces of evidence in the case for widespread election fraud. We have a voting system, as he acknowledges, that gives us no cause for confidence that our voting results are accurately assessed. Despite this, he claims that there is no cause for concern. I disagree as I find multiple independent paths of analyses give evidence that consistently points to massive widespread election fraud across our country. 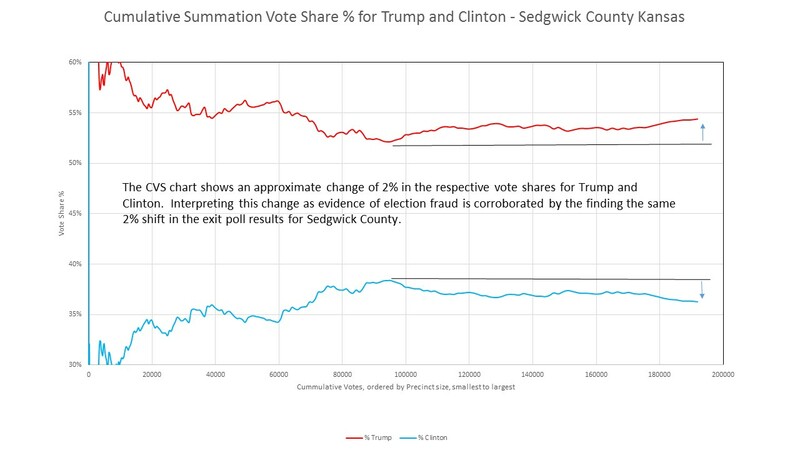 My specialty is statistics and I’ve pulled down publicly available data independently, analyzed it myself, and corroborated analyses which points to massive widespread election fraud. Mr. Holland disparages the mathematical work of Richard Charnin*, but I have not found an error in any of the analyses of his that I have repeated. In particular, his assessment of the binomial probability regarding the likelihood of the exit poll results, is both accurate and appropriate. I have verified it myself. This binomial analysis was ignored by Mr. Holland in favor of criticizing a different approach that was also used. That approach is also sound, but I have not reproduced those calculations. 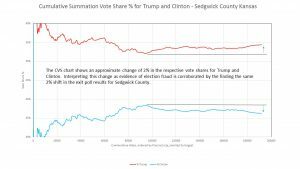 That both models show results that are consistent with the hypothesis of election fraud is more than doubly damning. 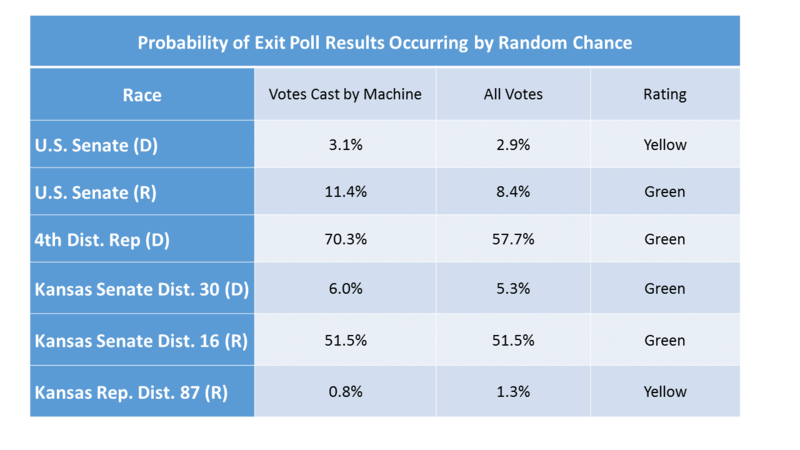 If we assume no election fraud, then the two different types of analysis of the exit poll errors are unrelated because one analysis looks at the size of the error while the other is based on whether it benefited Hillary versus Bernie. That they are both consistent with fraud could be considered a third piece of evidence in support of that hypothesis. The excuses Mr.﻿ Lenski, Edison’s executive vice president is quoted as providing are specious with regard to the magnitude of the anomalies we are seeing. Yes, there are issues that can lead to inherent problems due the different ways they performed the surveys. No, those reasons are not sufficient to explain the anomalies we are seeing across the country. There are only two possibilities – a) Bernie supporters are more likely to respond to the poll or b) there is widespread election fraud altering election results in favor of Hillary across the U.S. While we can never completely eliminate reason a, Mr. Lenski’s excuse is no more than a restatement of that first hypothesis while he notes that there is a a lower response rate (how much lower?) for the more detailed surveys conducted in the U.S. While it’s easy for the mathematically naive to infer causality from his statement, that isn’t automatically the case. Further, it’s not an assumption that should be made without explicitly stating it**. So which do you think is more likely across the U.S.: Are Bernie voters just more civic-minded and willing to participate in exit polls than Hillary voters or is some well-organized group of wealthy individuals able to successfully conspire to fix voting machines across the nation or are multiple independent local political actors across the country taking advantage of the non-transparent hackable voting systems? While you contemplate those options and estimate the probability of the first hypothesis with respect to the last two, let me review some of the additional evidence in support of the hypothesis of fraud. The apparent ease of hacking electronic voting machines combined with the prevalence of election rigging through-out the world and human history. Lack of basic quality control procedures: In most locations in the U.S., no one – not officials and not citizens – actually verify the official vote counts. Canvassing becomes a sham that involves verifying that yes, the machine produced outcomes all add up to the machine produced totals. In those places where the count was supposed to be publicly verified, citizens watching report blatant miscounting to force a match to the “official results”. Their testimony to election commissioners about such actions were met with a blank stare followed by dismissal of their testimony. I live in Kansas, home of Koch Industries and currently the reddest of red states with all public schools across the state on the verge of closing the end of this month. IMO these problems are due to election fraud. I believe the Governor, Senator Roberts, and most of the KS legislature would not have won in 2014 if a fair and honest vote count had been done. I do not make that statement lightly. I hold a Ph.D. in statistics and have been certified as a Quality Engineer for nearly 30 years. I’ve gone to the extreme of filing a lawsuit requesting access to the voting machine records to verify those election results. So far, I haven’t been allowed access. A few questions for Mr. Holland: Did you spontaneously decide to write about this? A reaction to a disparaging blog regarding a previous piece saying “don’t worry, the theater is NOT on fire” vis-a-vis election fraud. Or was it suggested? Assigned? Did your publisher encourage you to disparage these claims, despite your lack of expertise to regarding either surveys or statistics. Would a favorable opinion piece regarding such claims have been published? Mr Holland, you have not done the analysis for yourself. You base your opinion of its significance on the expert opinion you trust – Mr. Lenski, an executive of the polling company. My response is that I have looked into this deeply and I trust my own expert opinion on this matter. It is a justifiable conclusion that widespread election fraud is going on in this country. The Theater is on fire. We need to take care of this problem now! The fix, btw, is both easy and impossible. All we have to do is demand a transparent and accurate vote count from our election officials. *He disparages him for writing about the murder of JFK. Is it really foolish to think that someone besides Lee Harvey Oswald was involved in that? **It’s also a testable assumption, but Mr. Lenski’s firm is the only entity with access to the data to do the test. Posted on June 10, 2016 June 11, 2016 Categories Statistics, Voting, Voting machines13 Comments on THE THEATER IS ON FIRE!